What Will Happen at My SSDI Appeal Hearing? Will my SSDI Hearing Impact How Much Back Pay I can get? What if the SSDI beneficiary is not capable of managing their benefits? Can I apply for SSD while working Part Time or Going to School? Should I Apply for SSDI? How do I apply for SSDI? When Should I apply for SSDI? What Information will I need to apply for SSDI? Do I Need An Attorney to Apply for SSDI? When Should I Hire a Disability Lawyer? How much does an SSDI Attorney charge? Do I have to go to the lawyer’s office to get help with SSDI? Can you use a representative when Filing for Disability? How Much can I receive in SSDI Benefits? How does LTD differ from SSDI? Why do LTD carriers require you to apply for SSDI? Disability offsets – Two sources of disability income at once. What if my disability is not Listed by the SSA? Images of our Facilities and Friendly Staff. Who we are, where we are, what we do. Can I get Social Security Disability for Throat Cancer? Can you get disability for skin cancer? Disability offsets – Can I receive two sources of disability income at once? Can a spouse get SSDI benefits? Why Are Drug Prices So High and What Can Be Done About it? What clients say about us. Your chances of success go up as much as 50% when filing a claimwith an experienced Long Term Disability lawyer at your side. Terms the SSA uses to process claims. Alzheimer’s disease: for those who receive this diagnosis, lives will change forever. As defined by the Alzheimer’s Foundation of America, this silent foe robs those inflicted by attacking the brain’s nerve cells and/or neurons. Common symptoms of this progressive and degenerative disease are memory loss, decrease of thought patterns, difficulty with language skills, confusion and overall behavioral changes. Fortunately the SSA has listed Alzheimer’s under their accelerated benefits program. Seek experienced legal assistance to ensure all your financial needs are addressed. Alzheimer’s disease, or AD, is listed among the top 10 leading causes of death nationwide. Generally those afflicted will typically struggle with progressive symptoms for up to 20 years. There is aggressive research and clinical trials to determine the cause and possibly cure this vengeful disease. For the 340,000 Texans fighting their own personal battle with AD, there is a strong support system. In 1987, the Alzheimer’s Disease Program was established by legislative mandate. It provides support and information to patients, their families and long-term care givers. It was also established to heighten awareness and address the burdens of living with the disease for all those involved. The program, hosted by both the Texas Council on Alzheimer’s Disease and Related Disorders and the dedicated volunteers of the Texas Alzheimer’s Disease Partnership share these common goals. Improve state and local capacity to address AD. There is guarded hope for finding a cure as states such as Texas join together to rage battle against this cruel disease through research and assistance programs. The availability of Social Security Disability Insurance (SSDI) can also assist those afflicted by providing SSDI as employment options dwindle quite rapidly. 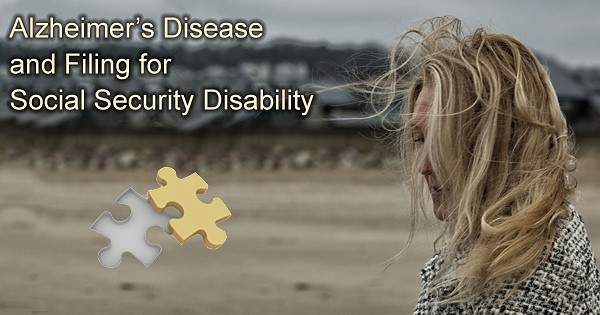 Contact a Social Security disability attorney at 512-454-4000 for a free consultation and get help filing for disability benefits while suffering from Alzheimer’s disease. During the early onset period of AD it is advisable to contact an experienced Social Security Disability attorney in your area to ensure all financial needs are addressed. Unfortunately, even with Compassionate Allowances guidelines, compiling all relevant data and making application for SSDI can become cumbersome. Advancements have been made with research, state legislation and the acceptance of AD into the SSA’s CAL. For the estimated 5.4 million Americans living with this relentless disease time is of the essence. The compassionate and experienced team of the law offices of Bemis, Roach & Reed would like to stand beside you in battle. We understand, time is of the essence. It is imperative that your application for SSDI is in compliance and quickly submitted to ensure you financial assistance so you can focus on your health. Contact us today for your free consultation. Call 512-454-4000 and get help NOW. "Words can not truly express the gratitude that I feel toward Mr. Lonnie Roach and his professional team. I give them an A+++. Very compassionate and prompt. Their priorities are first and foremost helping you succeed at your case. When you feel helpless, feeling like someone is on your side can mean the world to you. Thank you for working for the people." 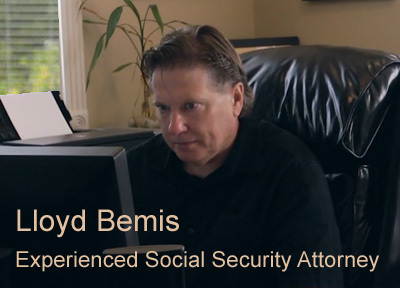 At Bemis, Roach and Reed, if we can't help you, we will try to find the right attorneys for you. We offer each of our prospective clients a free no obligation one hour phone or office consultation to see if we can help you and if you are comfortable with us. We know how difficult a time like this can be and how hard the decisions are. If we can be of assistance to you and help you find a solution to your issue we will even if that means referring you to another attorney. If you could provide us with some basic information about your claim we will get right back with you with a free case evaluation and schedule your Free Consultation Today. Can Social Security terminate my disability benefits? If your disability claim has been denied don’t give up.